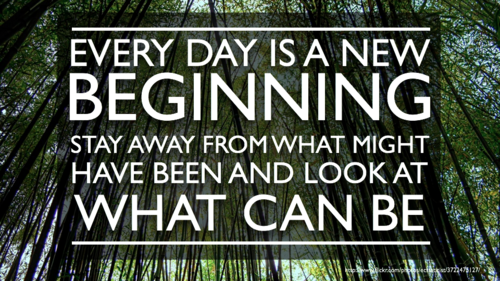 Every day is a new beginning in Me, and one is not more special to me than the other, says the Lord. My compassion is new for you every morning without fail. My great faithfulness sustains you through every night and greets you every morning. This is the day that I have created, and I say rejoice in it. Yes, rejoice in it. Again, rejoice! Do not let this day go by void of thanksgiving and praise unto Me, says the Lord. For I have blessed you with a new sunrise and renewal of your strength. Do not drag through this day as if it is a burden to you. Do not look at each task that is before you with drudgery. I have given you the power to conquer and overcome. I have strengthened you for this day’s journey. I have given you vision for what lies in front of you. You do not have to know what tomorrow holds. Just see the lighted path in front of you today and use your strength for the tasks at hand. Breathe deeply My fresh new breath of life in you and grasp ahold of My hand that is extended toward you. Hand in hand and heart in heart we will embrace every moment, overcome every challenge and fulfill every purpose I have subscribed for your life today together. You didn’t think you had to do it alone, did you? My easy yoke and light burden awaits your partnership as we move together through every moment of this day, unencumbered and rejoicing all the way, says the Lord.